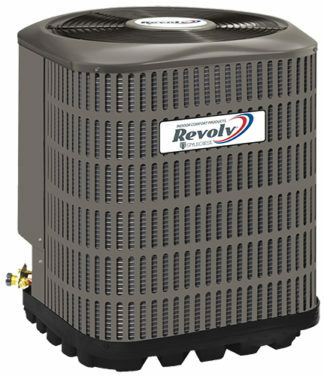 The heat pump condensing unit is the outdoor part of a versatile system of heating and air conditioning. It is designed to be custom matched with one of our indoor evaporator sections, each designed to serve a specific function for either furnace and/or air handler applications. All units are factory charged to assure optimum performance and easy installation. All models are hybrid heat compatible. QUALITY CONDENSER COILS – The coil is constructed of copper tubing and enhanced aluminum fins for increased efficiency and corrosion protection. PROTECTED COMPRESSOR – The compressor is internally protected against high pressure, temperature, and externally by a factory installed high pressure switch. This is accomplished by the simultaneous operation of high pressure relief valve and a temperature sensor which protects the compressor if undesirable operating conditions occur. A liquid line filter-drier further protects the compressor. DURABLE FINISH – The cabinet is made of pre-painted steel. The pre-treated galvanized steel provides a better paint to steel bond, which resists corrosion and rust creep. Special primer formulas and matted-textured finish insure less fading when exposed to sunlight. Durable Finish Inside and Out – Coil casings are made of pre-painted steel. The pre-treated flat galvanized steel provides a better paint to steel bond, which resist corrosion and rust creep. All internal metal parts are made of G90 pre-painted steel i.e. triangular plates, top plates, horizontal supports etc. Coil header plates are non-painted due to the brazing process during production. LOWER INSTALLED COST – Installation time and costs are reduced by easy power and control wiring connections. Available in sweat connect models only. 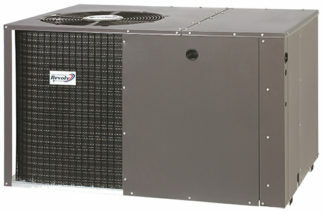 The unit contains enough refrigerant for matching indoor coils and 15 feet of interconnecting piping. The small base dimension means less space is required on the ground or roof. TOP DISCHARGE – The warm air from the top mounted fan is blown up away from the structure and any landscaping. This allows compact location on multi-unit applications. LOW OPERATING SOUND LEVEL – The upward air flow carries the normal operating noise away from the living area. The rigid top panel effectively isolates any motor sound. Isolator mounted compressor and the rippled fins of the condenser coil muffle the normal fan motor and compressor operating sounds. LOW MAINTENANCE – Long life permanently lubricated motor-bearings need no annual servicing. EASY SERVICE ACCESS – Fully exposed refrigerant connections, and a single panel covering the electrical controls make for easy servicing of the unit. SECURED SERVICE VALVES – Secured re-usable service valves are provided on both the liquid and vapor sweat connections for ease of evacuating and charging. U.L. and C.U.L. listed – Approved for outdoor application.